I'm back from DragonCon, and from my show this weekend at Disney Springs - had a fabulous time at both, thank you ALL so much for coming out to see me! I've got a lot of new beautiful paintings to tell you about today! 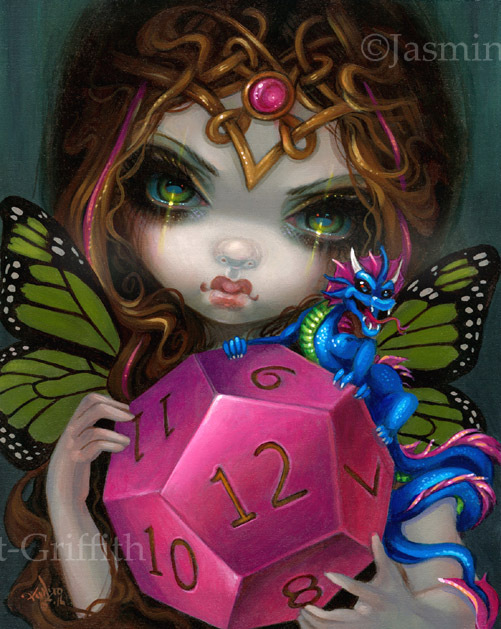 The first of the new prints available is "12-Sided Dice Fairy" - you can see herhere - we have prints, but the original has sold. 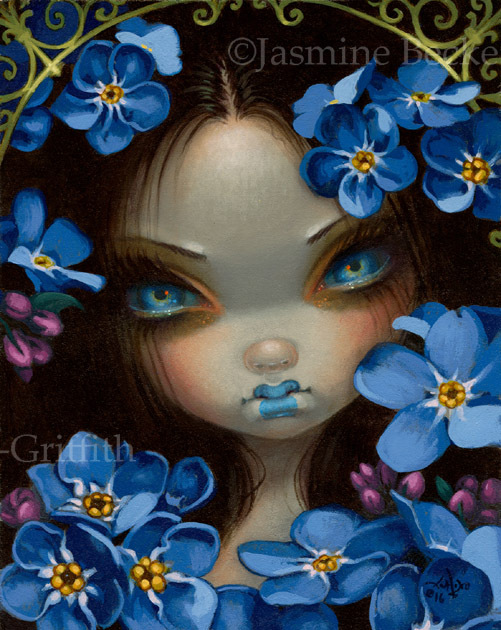 Next up is "The Language of Flowers I: Forget-Me-Nots" - we have prints available here - the original *may* still be available from Corey Helford Gallery - $2400 - email Jan here or call (310) 287-2340. 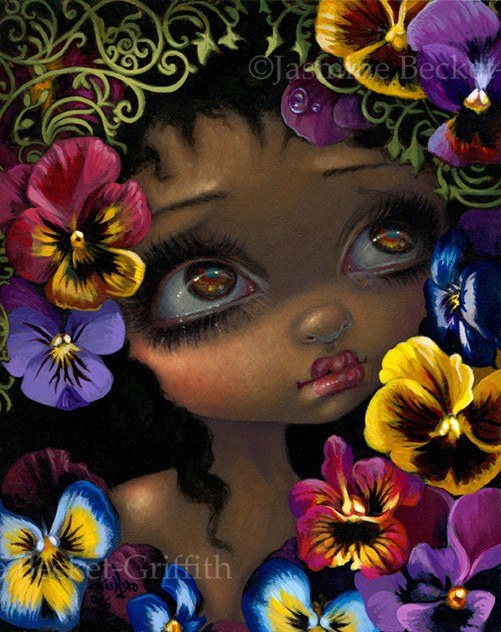 Similarly, we have the second in the series - "The Language of Flowers II: Pansies" - we have prints available here. I am 99% sure that the original has sold, but just in case I've been misinformed you can contact email Jan here or call (310) 287-2340 to double-check. In other painting news - I have a couple of pieces coming out in galleries soon! 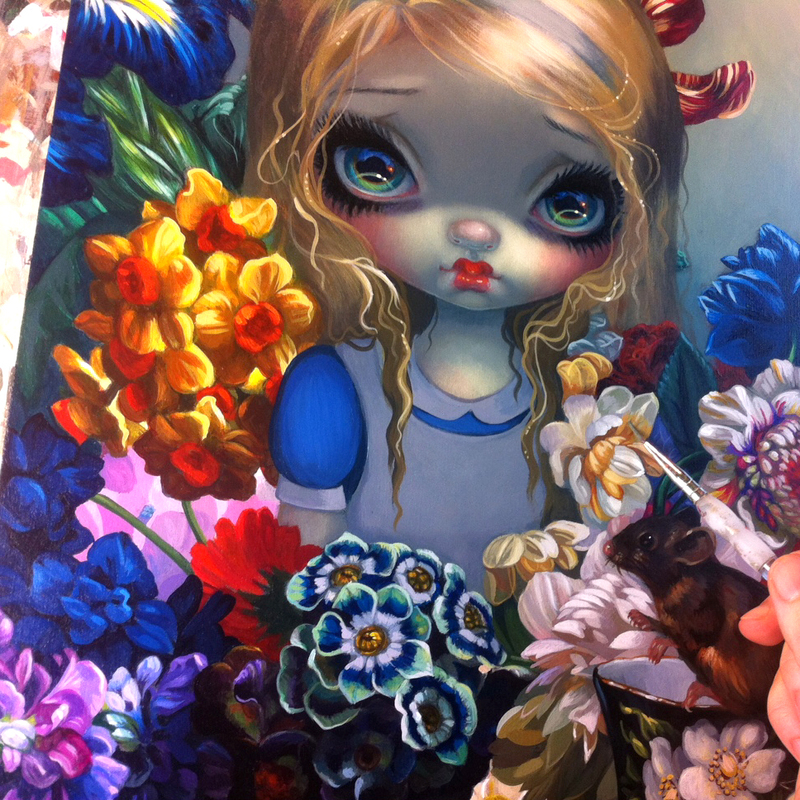 "Alice with the Dormouse" will be part of the Life Is Beautiful Festival (Las Vegas, September 23-26) "Crime on Canvas" show - if you are interested in the original painting, email Jay at mmodern@gmail.com - a sneak preview of the painting in progress is below. Similarly, my "Femme Fatale" painting is going to debut at Modern Eden's "Femme to Femme Fatale" art show in San Francisco this coming Saturday the 17th. A sneak preview of the painting in progress is below, if you are interested be sure to contact info@moderneden.com . And finally in other news, the Kansas City Renaissance Festival is up & running in full swing! I'll be there in person October 1, 2, 8, and 9) details here. Keep an eye out on the event page(s) - we'll be doing daily print giveaways for costumes and other fun stuff at my gallery there. I love her! The original painting has sold, but we have prints & canvases from $9.99 are on SALE this week at my website here (or go to Strangeling.com and search: dice ). Here she is! Many of you got to see her at DragonCon this past weekend - she is a beauty =) As a kid growing up I was very much into Dungeons & Dragons (still am, wish I had more time!) – a huge part of what made me pursue a career in fantasy art. The first things that attracted me to the game were the artwork/illustrations and of course all the funny-sided dice! This is the second piece in the series (be sure to check out my 20 sided dice as well). We have 8x10" glossy prints signed by me on the back on sale this week at my website link above - only $9.99. We also have the Limited Edition 8x10" canvas prints - hand embellished and signed by me in acrylic paints, signed & numbered & dated - an edition of 25 - those are wrapped on boards, ready to hang (wire hanger attached, glossy black sides) for only $100. Both options are at my website Strangeling.com here just use the dropdown Fine Art Print Options to choose either the paper option or the Lt. Ed. Canvas option. "The Language of Flowers II: Pansies"
These two pieces debuted as part of my “Allusions and Allegories” show from Corey Helford Gallery - The first one (Forget-Me-Nots, the blue one) may still be available - email Jan here or call (310) 287-2340. I am 99% sure that the original of the second one (Pansies) has sold, but just in case I've been misinformed you can contact email Jan here or call (310) 287-2340 to double-check. These are the first two pieces in my new series “The Language of Flowers.” The Victorian notion of rather than speaking or writing the words in a letter, a person could send a bouquet of flowers and the recipient would (assuming they understood the language of flowers) understand the hidden message. Pansies mean “you are always in my thoughts!” And Forget-Me-Nots mean, well - "forget me not!" Prints are also 8x10" - glossy paper ones signed on the back be me are $13.99 , and limited edition hand embellished canvases only $100. All prints are at my websitehere , just use the Fine Art Prints dropdown menu to choose the print option (glossy paper or limited edition canvas). email Jay at mmodern@gmail.com if interested! Here's a work-in-progress (nearly finished at this point) of my new "Alice with the Dormouse" - part of the Life Is Beautiful Festival (Las Vegas, September 23-26) "Crime on Canvas" show - if you are interested in the original painting, email Jayat mmodern@gmail.com . She's also a piece that will be appearing in my Alice in Wonderland Oracle Deck and my upcoming Alice in Wonderland Coloring Book. She's an original acrylic painting on a 11x14" panel, framed she is much larger, about 22x25". 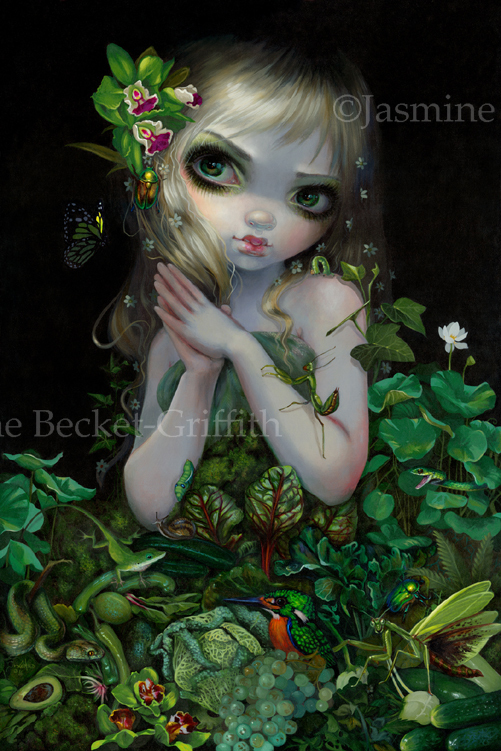 The original painting will be priced at $4000 - and again, just let Jay at mmodern@gmail.com know if you are interested in Jasmine Becket-Griffith's "Alice with the Dormouse" original painting from the Life is Beautiful Festival. We'll have prints & canvases up at http://Strangeling.com after the show too of course! The show will be fabulous, there is an amazing lineup including myself (of course! ), Camilla D’Errico, Shepard Fairey, Camille Rose Garcia, Frances Bean Cobain, Chet Zar, Ray Caesar, Kukula, Naoto Hattori, Travis Louie, Mab Graves, Tim Biskup, David Stoupakis, Jennybird Alcantara, Jeremiah Ketner, Ron English and so many more fantastic people it's ridiculous! 11x14" Acrylic painting on Panel - Price will be $4000 - email info@moderneden.com at Modern Eden Gallery if interested! Work-in-progress - almost finished! Her name is "Femme Fatale" - the piece I've painted for the "Femme to Femme Fatale" group show curated by Beautiful.Bizarre Magazine at the Modern Eden Gallery in San Francisco. She is an 11x14" acrylic on panel - she'll come beautifully framed, and will be priced at $4000. As with my other faux-pixellated paintings - yes, this is what the painting looks like - no, it's not done with a computer, I've painted all the little squares myself. Kind of got an Eve / Cleopatra theme (the snake is based on the one in Winter's 19th Century Cleopatra) emphasizing the Femme Fatale theme. Unfortunately I don't think I'll able to make the opening reception in person, but a lot of the other artists will - if you are in the Bay Area definitely stop by! Last Chance - "Green Goddess"
30"x20" - hand embellished by me in acrylic paints, signed, numbered, etc., wrapped on boards and ready-to-hang on your wall!